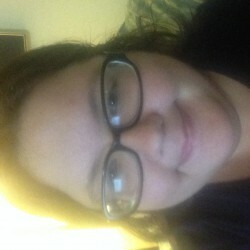 I am a professional writer who also loves to read! Please follow my blog to learn more about my work and the books I am reading! 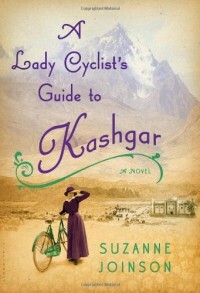 I just finished reading A Lady's Cyclist's Guide to Kashgar, a book that had been on my reading list for a while. I had initially chosen to read this book because the concept sounded so great. 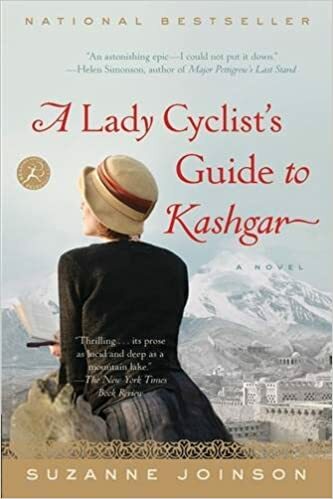 After all, it is about a group of female British missionaries traveling through the Middle East via bicycles in the 1920s, so what couldn't be bad about it? Plus, I liked the idea that there was a "flash back" element with the Frieda of the 1920s, and another Frieda in our time, who inherits contents in the apartment, which we later find out is the original journal that one of the 1920s missionaries kept while traveling to Kashgar. However, when I first started reading this book, I will admit I had a hard time appreciating Joinson's vision. The reason why was because the flashbacks don't immediately tap into the link between the two Friedas, nor hint enough at the link to make you motivated enough to want to learn. I even had a hard time motivating myself for a while to read it, because it seemed like it took about 100-200 pages into the book to actually realize the link and comprehend why Joinson chose to use flashbacks as part of the narrative between both Friedas. Nonetheless, I have grown fond of this book and I applaud Joinson for her vision of creating this novel that celebrates feminine resilience and Middle Eastern culture. Her narrative choices are very well done, however can be confusing to the reader because she goes back and forth from the 1920s journal, written in the first person, and the third person narrative about 21st century Frieda. Since there are two stories going on at the same time, with no clear link at first (and not even a hint) it may make you feel like that the journal's story is being unnecessarily interrupted by this other story that you are unsure of where it came from. Furthermore, the details that Joinson gives us about the characters isn't that interesting, nor enveloping in regards to creating the scene as I know I would personally like to see, especially since this novel takes place in the Middle East and Joinson lived and traveled in the Middle East for many years. Nonetheless, Joinson's use of Middle Eastern culture, language and history in this novel reflects her familiarity with the region. I personally would have liked to have seen more descriptive elements that helped to paint a more vivid picture of the Middle Eastern experience that 1920s Frieda and her fellow missionaries experienced and saw. I just didn't feel as transported with the journal's narrative as I did with the third person narrative of 21st century Frieda, which seemed to be more interesting. Despite that sentiment, this is a worthy read and I'm glad that I read it. It is well written, well thought out, characters are good but I didn't find them to be memorable. I will warn that this is a very complex, slow read that is not for everyone. If you like to read literature, however, and don't mind complicated narratives and slowly developing plots you will enjoy this novel. I don't feel this novel is character driven, but the characters are certainly integral and do contribute to plot development. However, the novel's narrative is plot driven, in regards to revealing the plot, the purpose and link of the characters, and the themes within the plot. My newest book, When You Were Here is out! 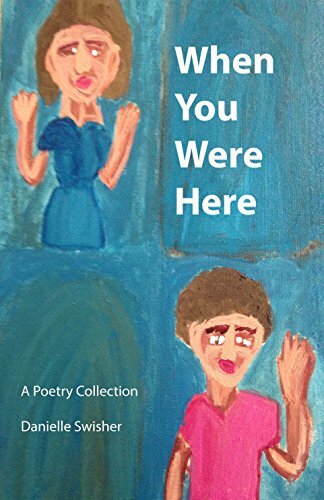 My newest book, When You Were Here: A Poetry Collection was released on April 2016 through Cawing Crow Press. I am always excited when I publish and release a new book, but not as much as this one has excited me recently. I guess it is because I feel I have within this book some of the best poetry I have ever composed. It's a shame that the majority of the poetry was inspired by a tragic period in my life. You see, during the year that I had begun to compose most of the poetry now featured in When You Where Here, I was getting over a break-up with my ex-boyfriend, I was underemployed, and I had reconnected with a "friend" whom I had complicated feelings for who just didn't appreciate me, nor treat me very well. This environment inspired me to create poetry that not only expressed my feelings, but gave me a platform to cope with what I'm going through. One thing I strongly believe in when I write is that creative writing especially can help me to cope with difficult situations because I can "give my problems to the world" by creating art with it. When I do this, it no longer becomes my problem, but a work of art that will be loved and appreciated by others. Therefore, it no longer bothers me, but now becomes used to create something artistic and beautiful, which makes me feel better, and hopefully empowers my audience. As a result, I truly write with my heart, and I would say that the poetry in this collection expresses that completely. Never have I been so vulnerable on the page, even though I never write without being vulnerable. This, mixed with my artistic vision of wanting to capture a moment within metre and diction, helps to create the poems within When You Were Here. When I put these poems together, I didn't intend to create a themed poetry collection. My first poetry collection, Reflections Through A Radiant Mirror: A Poetry Collection, wasn't meant to be themed either. Reflections Through A Radiant Mirror features more abstract themes than When You Were Here does. The reason why When You Were Here is so themed around love and loss was because at that point in my life when these poems were written, love and loss was a theme in my life, and I wrote with the effort of taking that theme out of my life. With that being said, please don't assume that the poems are depressing. They are actually a celebration of life and the individual. What makes these poems beautiful is that they look at the fragility of life, over how beautiful, positive things like love and happiness can be tested by tragedy, loss and disappointment. However, the poems do stress upon reflection that it is up to us as to how we let these losses, disappointments and tragedies treat us and affect our lives. If we learn to let go of them, and place them in the past and place them in perspective, better days are ahead. It is through these efforts, that we better learn about ourselves and find ourselves and what makes us happier, more fulfilled and successful. Sure enough, my life is turning around for the better, and creating When You Were Here was the beginning of that. How can you be so callow, so cold and distant, without any sign of remorse or compassion? When you act thusly when it is convenient for you? who needs lungs and the air to breath, water to quench thy thirst, food to satisfy thy hunger? Look around you, other humans desire the same needs you ardor for! Go seek them out. treat each and every one of them with respect and honor. Reward them for being human, because they are like you, vulnerable, yet magnificent and sentient. Be their leader, not their demise. Seek them out, for in return, you shall discover yourself to be more than just a callow, materialistic being, who has lost his humanity and his pride. Your very soul and mind. To you, life is but a meaningless state of being. You believe that when we die, we turn to dust, and fade away. that upon our body’s death, must grow and become like light that guides us all. In this way, we continue on. We touch the hearts and minds of the living And those not yet born. Truth is that while we are here on this Earth, we are surrounded by wonders that surpass anything we could imagine. like trees that stand the test of time, vast oceans of life, stars in the clear night sky, and the universe that lies beyond. Still, Every living thing has a purpose, and a light to follow, which they must be in tune with. So that when they Tread off the path, gentle nudges can realign their purpose not allowing, trepidation and strife to take over. I ask you, where has your life’s purpose gone? Has the light of your path faded away? Have you just ignored the hand that guides? Or, have you just not noticed that it was there? is say that I care, and hope that it will be enough to help you find your way to the promises of birth and death that are awesome and breathtaking to behold. Welcome to the sea of grass. May you glide along its sodded waterways, the flooded plains of North America’s largest swamp. Gaze upon its endless horizon, where Mother Earth kisses Father Universe, ever procreating and filling the Earth with life and vitality forever more. The sleeper and the lamb know not who made them, but instead, know how they came to be. But they don’t know that, and that’s ok. So, hopefully I have whetted your appetite for my new poetry collection! You can purchase it at most bookstores. Please check out the link below to purchase it, and some of my other books, all available on Amazon and most major book stores. Thank you and happy reading!